The Division 2’s story is as bland as a bowl of hot water. We can’t recall much of what’s happened in the 30 hours we’ve spent with it, other than we’ve killed a lot of bad people, and we can remember perhaps two of the NPCs we’ve met. And yet, as much as we usually crave a good story, we can’t stop playing it. It’s a reminder that solid shooting, a world full of varied activities and a generous loot system are more than enough to hold your attention, even if you don’t care about the characters. After Anthem, it feels like a palate cleanser – Bioware’s looter shooter was boring and repetitive, but The Division 2 consistently surprises us. Where Anthem was stingy with its loot, The Division 2 showers you with it. 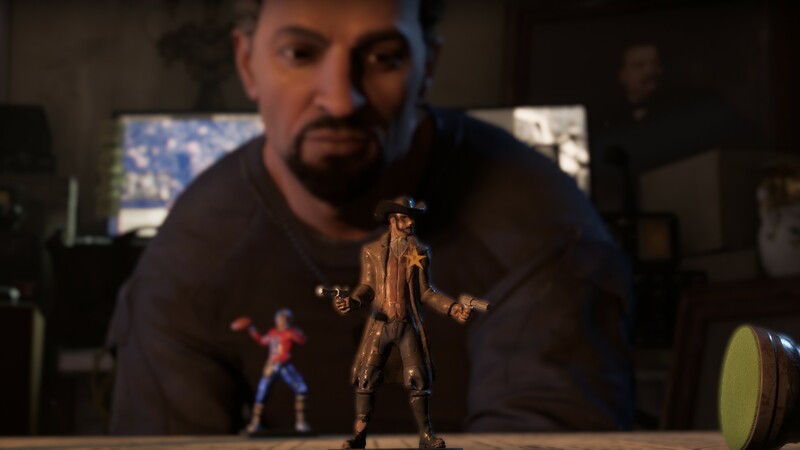 Every mission, every side activity, every random stroll around post-apocalyptic Washington DC rewards you with something new and shiny to grab. We upgrade on the go if we pick up something that’s obviously better than what we’re currently wearing, but we like to blast through a couple of missions and then spend a solid 20 minutes sorting through out items, tweaking our loadout to find the perfect combination. It’s not just that your numbers are constantly ticking up, although that’s admittedly part of the appeal. Gear feels unique, even if it doesn’t look it (military browns and greys are still unfortunately in vogue). Items have extra bonuses and attributes beyond their core function, and the way these stats interact can meaningfully change your playstyle from one story quest to the next. For example, from levels 20 to 25 we wore a combat harness that had the restorative talent, which granted us 10% health when we kill an enemy. It was a lifesaver, and we turned down items that had better damage protection to keep it equipped. That same harness granted us 4.5% extra headshot damage and a 10% boost to SMGs. For that reason, we opted for a Tommy Gun over a shotgun as a secondary weapon. In the later game, these stats are more than just numbers. We’re currently carrying a shotgun that, with every bodyshot, stacks extra damage onto our next headshot. It dictates the way we play, and we deliberately aim for the body hitbox before blasting an elite boss in the head. 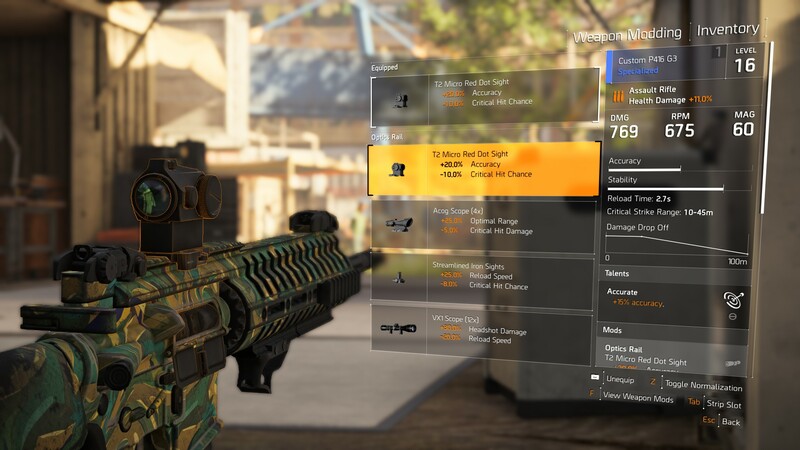 The talents of top-tier items will make you want to build your loadout around them: we’ve found some high-end gloves that boost your damage when the chance of a critical hit is low, so we’ve deliberately equipped weapon mods that reduce that chance. What’s more, gear is made by manufacturers, and wearing more than one item from the same company grants you further bonuses. We’re decked out with Providence Defense equipment, which gives us 8% extra health, a 5% weapon damage boost across the board as well as extra ‘skill power’. This last stat determines how effective your skills – gadgets, basically – are, and most skill mods require a certain level of skill power before they work, making it another differentiating factor between your various bits of gear. All these numbers mean that, at the end of each mission, not only do you have 20 new sets of knee pads, backpacks, gloves and body armor to sort through, but you have proper decisions to make about which ones you want to equip, and you won’t necessarily go for the one that has the highest armor value. But loot without fun quests would mean nothing. Anthem’s missions were dull, and we felt we were completing the same objectives over and over in slightly different settings. It even put unimaginative tick box objectives – kill 50 enemies with a melee attack – in the main questline. 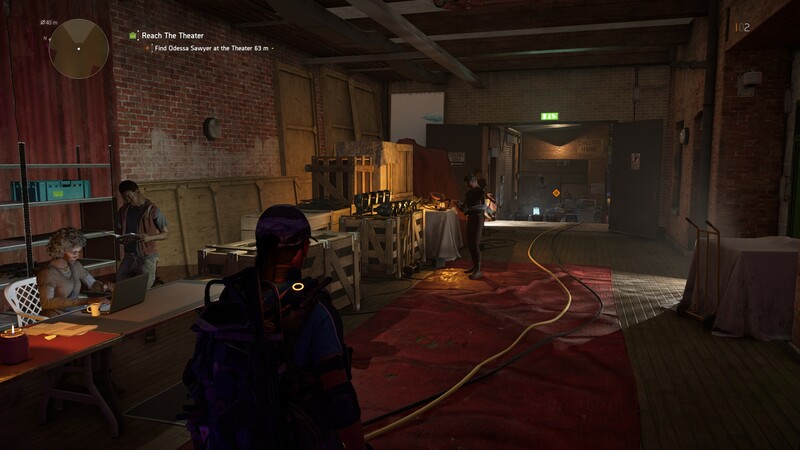 The Division 2’s missions, on the other hand, are consistently fun. We’ve fought in a planetarium as the stars whizzed by, stolen the Declaration of Independence, escorted the President out of a bank vault to a waiting chopper, and battled through exhibitions of ‘50s memorabilia in the American History Museum. As forgettable as the plot of these missions is, the set pieces are memorable, and every story mission has at least one moment that we want to screenshot for safe-keeping. When you’re done with an individual mission, you’re spat back out into the open world, ready to take on another. Anthem booted you back to its Fort Tarsis after every quest – in The Division 2, you’re a two-minute sprint from your next objective, and you’ll likely pass four different side activities on the way. We haven’t yet tired of these distractions, probably because Ubisoft rewards you handsomely for competing them with XP and, crucially, better gear. Most Control Points follow the same pattern, but you unlock a supply room at the end of it that’s packed with goodies, so we take on every one we see. We’ve also found some of our best gear outside missions, particularly in underground sewers we’ve explored out of pure curiosity, which gives you a constant reason to explore. It helps that The Division 2’s combat mechanics feel great. Anthem’s combat was probably the best part of the game, but we enjoy The Division 2’s firefights more. The enemies’ aren’t as vulnerable to damage as in the first game, so you can down grunts with a single burst of fire. More importantly, they seem much smarter, and will coordinate their attacks. While one throws a flashbang and locks you down in cover with suppressing fire, another will wrap around your flank and fire a tank of grey, sticky goo that holds you in place, giving other enemies free shots at your head. Although we haven’t cared for The Division 2’s story, we’ve enjoyed the way the world reacts to us. Capture a control point and you’ll see friendlies wandering around the area on patrols, or ferrying supplies back and forth to settlements. As you complete story missions, those settlements around the city evolve, adding new points of interest as well as visual upgrades. Just like the ever-changing loot, it gives you a sense of constant forward progress. Every time we finish a mission, we open our world map to find five or six quests that excite us, which simply didn’t happen in Anthem. Each has new enemies to kill, over-the-top set pieces to be a part of and – most importantly – a new pair of slightly better gloves to discover.